I think you should minimise your efforts at the reddit atheist's (magic sky fairy) forums Jacky...obviously it's not emotionally healthy for you. Number of believers was 763.775.585 in September 2018. In other say, number of believers have 17% decreased in one month. We did not examine the NASA believers in past month, so that we can not compare changing the number of NASA believers. Google trends can not give us a number of believer. But it, like its name, gives us an idea about the "trend" in the world. Number of believers of the flat earth in October 2018 is 633.475.177, by decreasing 17% compared to September 2018. We have to focus on this decreasing reality, what has caused it. Perhaps we have to focus more research instead of playing game. Sure and it was wrong then and will still be wrong. No, it doesn't! Searches on Google could just as easily be people like myself who are researching flat earth rubbish to assist in debunking it. Your method is total ribbish and it might show "interest" but that might bear no relation to the number of flat earth believers. You know you'll not get a reply to your post since you have seperated my upper post, don't you? Are still not indicative of how many believe. Your methodology is fundamentally flawed and does not allow you to determine the conclusions you are trying to. You might be able to determine interest, but not belief. Someone searching for X does not mean they believe in X. Someone not searching for X doesn't mean they don't believe in X. And even if we don't you still wont rationally respond to what has been said. You ignore anyone who you can't refute. Tough cheese, who cares? But you always ignore the truth! But on this topic, I searched for "Nibiru will collide with earth" and there were "About 189,000 results". Is this the slightest clue that anything like 189,000 people believe that "Nibiru will collide with earth"? Many of the matches are explaining how the belief in Nibiru colliding with the earth is complete nonsense. the earth has been believed to be a Globe for over 2 millennia and there is now such overwhelming evidence that the Globe can be considered an undeniable fact!. Wise, I started to go back through the 7 pages of this, sorry, got distracted/bored. How did you derive the ratio of 1.410.000.000 again? 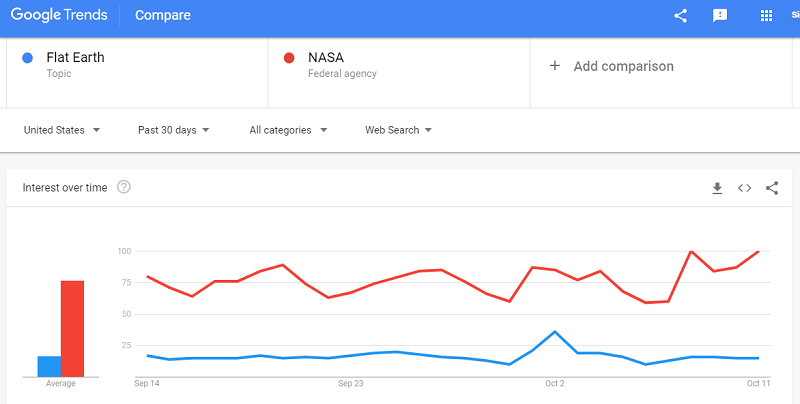 To Jesus versus NASA search queries, etc.? Maybe if you could repost a concise methodology with your reasoning for derivation as your preamble to the bottom-line statistical analysis, we could track appropriately. Right now, it's kind of a garbled mess of inference and religious belief benchmarks. I'm not sure what to make of it. You guys do realize that those result numbers are estimates of number results and do no equate to number of queries. Google admits they aren't accurate. Utterly and completely. Just trying to level set the madness. I have explained it as ratio between number of believer and number of search. If you search something, so you have an interest about it. There is 1.400.000.000 search for Jesus. Are all these 1.400.000.000 believing jesus? No.some of them believe, some of them curious, and some of them try to "disprove jesus" and search opposite material. Flat earth is so too. In this working, I am taking same ratio of belief-search relationship. Until today, my results are compatibled with the reality. Public polls support this result. When I was saying believers 2% of rest, it was so according to polls. If you create a poll today, so be sure you'll find 9% some today. It was 10% in september. It has not to be definitely 9%. It may be 8 or 10 too. But it gives us a good estimation. All have a logical logic. What does Jesus have to do with all this? In this working, I am taking same ratio of belief-search relationship. And that relationship is far from static. It will vary between topics and even over time. As such, there is no logic. Statistic. You are far to the science. There is a relationship between search numbers and believer number, and this is a logic. But you have not logic to get this. Great. Statistics. So if there are 2.2 billion Christians, you derived some percentage of those who are Flat Earth believers? If so, what is that percentage and how did you derive that? And why pick on Christians? According to that Forbes poll, 2% of Americans are flat earth believers (6m). Wouldn't it just be simpler to extrapolate that to the entire world regardless of faith? You know, like 2% of 7 billion is 140m. Statistic. You are far to the science. There is a relationship between search numbers and believer number, and this is a logic. No, I understand the science quite well. If that logic of yours was correct, you would be able to search for things like "Earth" and "air" and "water" and come up with 7 billion people believing. Notice that these numbers are different than yours due to a different location the search takes place in, so that already shows significant issues. Now, you want to use the number of "Jesus believers" as the standard so let's use that. That means each search result amounts to 2,200,000,000/717,000,000=~3 believers. So this means that according to your "logic" roughly twice as many people as exist believe in water. Where are these extra 7 billion people hiding? Meanwhile, not everyone believes in Earth, the planet they are living on. Do you not think there might be issues? There is no direct correlation between number of people who believe in X and search results for X. You are baselessly assuming a correlation. That is not science. That is pure nonsense. Even if there was such a correlation, there would be no reason to assume the correlation is linear, or that other factors do not have any influence. Science for this would not be making such grand claims as you, asserting that there is a simple linear correlation and that can be used to determine the number of people who believe in X. Instead, they would investigate, looking at a wide variety of topics/beliefs, including some which are true and some which are false and analysing it to determine what correlation, if any, exists between the number of people who believe and the number of search results. They would also compare other factors such as location and popularity. Only once they have done that would they then proceed to make predictions, and they would test those predictions to see how accurate they are. Then if it has been tested enough they might proceed to make more predictions, giving error bounds. So no, there is no science and no logic behind your nonsense. A better method would be similar to that suggested by stash, but adjusting for other factors where people believe nonsense. Perhaps link it to how religious the country is, as FEism sure seems to be religious. If your method was valid it would require more people than exist to believe in water. This shows your method is pure garbage and not scientific in any way. Not my method by your claim is garbage. Water is not a belief but a reality. You can compare belief vs belief, liquid vs liquid. You are comparing two thing have no relevance, with you invalid claim you start a baseless insults. Insults do not in your benefit just show you ugly. No, your method is garbage. How do you have more than the population of Earth believing in water? That is what your method claims, so that is what you need to address. As for belief vs reality, good job insulting every Muslim and FEer and Christian and Hindu, as you have just declared that none of that is reality as it is merely a belief. Back in reality, it doesn't matter if something is reality or not. Just because something is reality does not mean everyone will believe it. RE is a reality, yet plenty of people reject that for no valid reason at all. So no, people are free to believe or not believe in water. But your method requires more people than exist to believe in it. How is this possible? 1 - There are these extra 8 billion people hiding somewhere that believe. 2 - Your method is garbage as there is no simple linear correlation between belief and search results. I sure know which one I think is more likely. Of the flat earth believers in your poll, Wise, how many occupy mental health institutions, how many are in drug rehab, and how many are school children? No, you are completely wrong. Your thoughts are garbage. Water is an concrete, but beliefs are abstract. Their calculate method is different. For example you use x3 method but it is only valid for beliefs. You can compare water with something in its category. There is only one thing we can compare water; well known and liquid: oil. about 3 times more. It means, people interest water 3 times more than oil. In other say, 30% of world population interest the oil and rest people do not interest. You can not the statistic of water to comparing any belief. But you can compare beliefs around themselves. You can compare countries by themselves. Look. I type some countries. Sounds like there is a coreleation, true? Only spain seems on wrong place. This is the list of "touristy countries". France is the world leader and most searched. Turkey is 6th place and 6th in searching list inside this 6 countries. For example Russia: 855 million. Why it is so? Because Russia is a big country but have less tourists. You can compare non touristy countries between themselves. There may be some exceptionals but generally works. Wise you are wrong. I can create a forum invoking some outlandish belief that no else believes and worded in a way that has a unique search. Every day I can post 3 topics on my forum and each day the search results will increase, yet the number of believes will still only be 1. First, quit with the insults. This is the last chance you get with me being nice. Insult me again, and I will go back to splitting your posts up to make it clear to everyone else what I am responding to. No. I'm not wrong in the slightest. Yes, water is real. But you claim a flat Earth is real. So they would be directly comparable. The Christian claims Jesus is real. The Muslims claim Muhammed is real. And so on. Your method relies upon their being a direct linear correlation between belief in something and the search results for it. Water is something people can believe in so it should work as well. But now you admit that other things can influence link interest. This is an admission that your method DOES NOT WORK! It shows that it is not a simple linear correlation. You are admitting that there are other factors and at best you can only compare like things. If that is the case, only compare like things. This would give you a list of things like religions, where you can compare Islam, Christianity, Hinduism and Judaism, a list of religious figures, a list of various conspiracy nutter garbage. Note this would mean that FE is not in the same group as religions and religious figures, unless you wanted to claim FEism is just a religion. 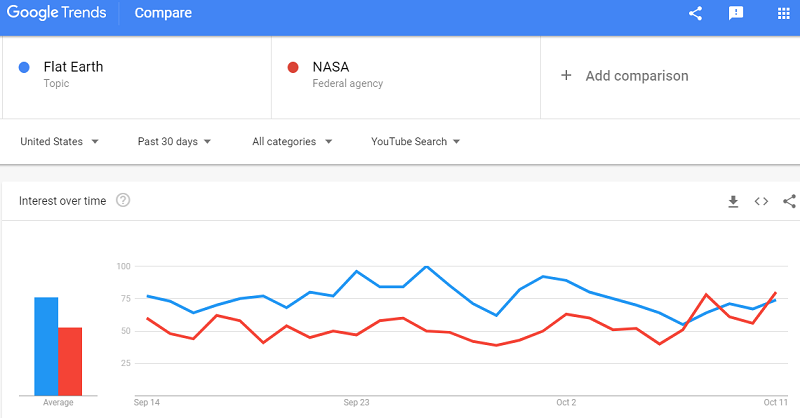 Also note that it would put NASA in a completely different category. NASA would be in the same group as water, a real thing that no one can rationally deny exists. Yet you have had no objection to mixing completely different things before. It is only now that it shows your method to be pure garbage that you do; but you don't make any correction by providing things you can compare FE to. Speaking of religions lets try that. Notice how that doesn't even work? Not only does it get the numbers completely wrong it gets the order wrong as well. This shows there are a multitude of factors, like interest and what type of subject it is. Do you know why that is? Because there are many reasons people will make pages. Some will do it because they want to criticise it, some will do it because they believe and want to convince others, some will do it to report on news. Also note that none of these will imply a linear correlation. One which is very unlikely to be linear is people trying to convince others to believe. You don't find articles trying to show that water is real, because everyone accepts it is. If there is only a small portion of people beleiving in something, it will have vastly more results than you would expect from a simple linear correlation. What this all shows is that you cannot simply say search results correlates to the number of believers. i.e. YOUR METHOD IS GARBAGE AND NOT SCIENTIFIC IN ANY WAY! Again, for your method to work (and be scientific in any way) you need to have the number of believers in X being a direct linear correlation to the number of search results, with no complicating factors. This means you need to have twice as many people as exist on Earth beleiving in water. In order to avoid that massive failure you need to perform a multidimensional analysis (i.e. lots of variables), with lots of different things to show what the true relationship is between search results and these factors. i.e. you need to be able to predict what the number of search results will be for a given thing based upon what it has for these variables. Until you do that, you have nothing except garbage. Your methodology is garbage and your statistical analysis, if we can call it that, serves only you. YOUR METHOD IS FUNDAMENTALLY FLAWED! You have now admitted it isn't a simple case of number of results=k*number of people who believe in X. If you want to make it is scientific you need to account for all the variables so you don't predict that more people than exist believe in water. If you want to say it only works in specific groups to avoid that, you need to show that you are appropriately grouping FE and NASA. "Beliefs" isn't enough. It is completely unscientific to just assert that it should be a direct linear correlation, and even less scientific to then admit it isn't without correcting your mistakes. I did not say it works in elements which are in same group have similar properties, because I have already did it so and not required an extra explanation with considering everybody here have a mentality and get it. I do not need a prove methods reliablity with make a coreleation between different examples. Because I have claimed a relationship between number of searches and number of beliefs. And proved it by writing their number of believers. There is a coreleation and this is a proof. You agree it or deny it with your childish appeals and insults, can not change this fact. You've manufactured a correlation as far as I can tell. 1) Step C: Why does searching on the keyword ‘Jesus’ automatically create a relationship (correlation) to the number of Christians in the world? 2) Step C: I may search ‘Jesus’ and I’m not a Christian - How am I factored in? 3) Step C: More specifically, I presume many Non-Christians have used the keyword search of “Jesus”. How are they discerned and accounted for? 4) Step E: Why are you multiplying the ratio with the number of keyword searches for ‘Flat earth’? What's the reason for multiplying? 5) Lastly, what does religion have to do with this?